Canadian Lawyer has this piece on the new research and information sheet from CFCJ. Mirroring Noel Semple’s listserv post, this post mentions that the Windsor Yearbook on Access to Justice has become an open access journal. Attached is the first fact sheet coming out of the Cost of Justice project at the Canadian Forum on Civil Justice. 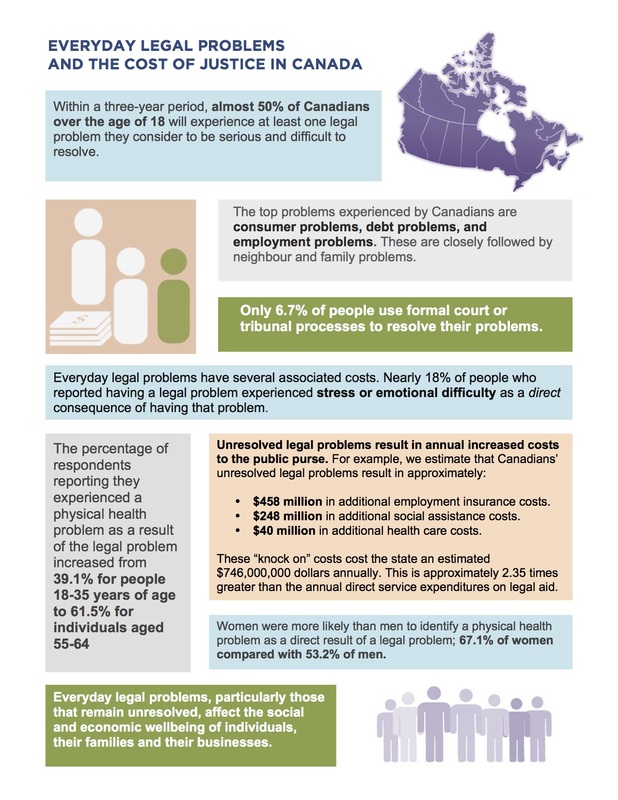 This fact sheet proceeds the release of three research papers that analyze the preliminary data from our national “Everyday Legal Problems and the Cost of Justice in Canada” survey. We expect to release these papers over the course of the next 2 months. Please feel free to share the fact sheet widely. Richard Zorza has posted on an upcoming ABA Equal Justice Conference and self-represented litigant pre-conference. At Open Law Lab, there is a post on the development of medical-legal partnerships in the US.